Ramen is Japanese noodle soup consisting of wheat noodles, rich broth and meat / vegetable toppings. Ramen is one of the most popular foods in Japan. In the 1990s Ramen was introduced to the United States as another “Japanese Delicacy” and has become very popular in NY, LA and SF. Ramen noodles are made from ﬂour and water kneaded in the ratio of 7 to 3. The water used for making ramen noodles is called kansui, which is a type of alkaline mineral water. Kneading ﬂour with kansui gives the noodles a unique ﬂavor similar to Chinese noodles, as well as a ﬁrm texture. In addition, Kansui adds a yellowish hue after it reacts with ﬂour pigment. To prevent noodles softening too much from boiling them, eggs, gluten and salt are added to the ﬂour. We currently offer seven different types of fresh ramen noodles from thick to thin for any style of cooking or preference. Ramen soup is usually prepared with soup formula and broth. Soup formula is made from seafood extract, seasonings such as miso, and soy sauce. Broth soup is made from pork bone, chicken bone and vegetables. Hot water can be used as a substitute for the broth. 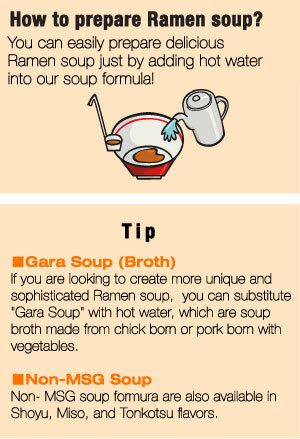 Create your original Ramen menu with your choice of Wismettac’s Ramen ingredients! We have four popular soup formula for you to choose from: Shoyu (soy sauce base), Miso (soy bean baste base), Tonkotsu (pork born base), and Shio (lightly salted). As our soup formula are rich and flavorful , you can easily prepare delicious Ramen soup just by adding hot water into soup formula. This ramen soup combines Umami from Kombu (seaweed or kelp) and ginger with the rich taste of soy. Oil and fat used are vegetable-based, creating a light and mild taste soup. This ramen soup offers the rich flavor of Awasemiso, a mix of Shiromiso (light-brown or white miso) and Akamiso (dark-brown or red miso) from Hokkaido. It is accented by blending savory herbs such as garlic and ginger, and toasted sesame seeds. This is a real Tonkotsu soup—a specialty of Kyushu Hakata. It artfully combines mild flavor with a full body and richness. This salt-flavored ramen soup is made from ingredients of the Umami, including bonito, dried sardines, and sea tangle. By adding onion flavored oil, it carries lightness as well as rich flavor. We currently offer seven different types of fresh ramen noodles from thick to thin for any style of cooking or preference. Please choose your favorite toppings from our popular Ramen toppings. Select popular appetizers to add to your Ramen menu. Copyright (C) 2015 Wismettac Asian Foods, Inc.